Years ago I submitted myself as a potential donor for stem cells. I went through the whole rigamaroo of giving blood, getting tested, etc. Unfortunately, I was just called by the organisation that arranges this to go over my medical history. Unfortunately, the thrombosis and subsequent pulmonary embolism I suffered in 2013 makes me no longer eligible to be a donor. Kind of sad about that. Meet my right ankle, it’s been very, very bad. Early November, during training, my ankle locked up as it is wont to do. I couldn’t get it to unlock before my patience ran out so I decided to continue training with a locked ankle, which wasn’t ideal but it didn’t bother me too much. The next day I woke up and it had swollen up to the size of a tennis ball. Eew. It remained swollen for longer than I was comfortable with, so after quite a bit of bullying from friends and family, I ended up going to my doctor. After hearing the trouble that I’ve been having with that ankle since I was six, I was sent on to an orthopaedic specialist at the hospital. There they made the x-rays you can see above and informed me that I had about a dozen bone splinters rummaging around in my ankle, which is bad. It was explained to me like there was a hand full of pebbles tossed into a gearbox. Also, some of the edges had grown spurs which were impeding the full range of motion of my ankle. All bad. I had an MRI made to see if there was any damage to any ligaments or any swelling inside the joint. It turns out there was. One of my outside ligaments had lost much of its strength and apparently required some “stitching” because the bone fragments had likely caused damage to it. 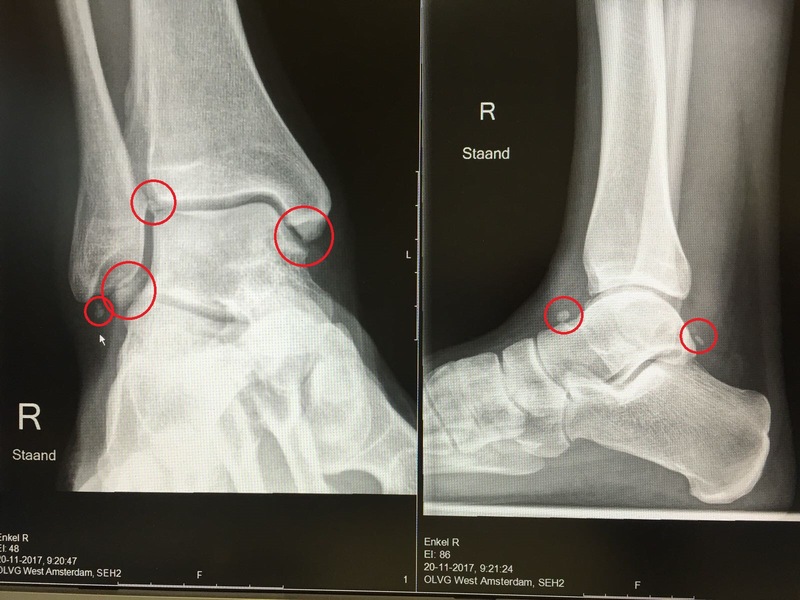 The advice I got was to have surgery to clear up all the debris from my join, shave down some of the bone spurs, have that ligament stitched up in order to reinforce it, drill a few holes in my fibula and pull the ligament through and attach it on the other side in order to tighten the whole ankle up. Recovery time? Six weeks of a cast, and at least another six weeks of fysiotherapy. After running about 5km together with Moulsari two weeks ago, I felt good in doing a longer stretch and was surprised at how easily I could do it once I had put my mind to it. I decided to ramp up my running just a bit. Unfortunately, I didn’t see a good way of running longer in my neighbourhood, so I decided to do it a little differently. Next to my apartment there’s a rather long bridge, (Jan Schaeferbrug) that crosses a wide canal and leads to a neighbouring island. It’s a two-lane bridge, flanked on either side by a bicycle path and a foot path. The two foot paths end on both sides at staircases leading down to the embankment, so four staircases in total, plus two extra staircases leading back up on the island side of the bridge. Six staircases altogether. When I start running, I immediately run up one of the bicycle paths, cross it and go down the staircase on the island side. I run across the island, across another bridge to the other side of the canal, running the length of the island, back to the Jan Schaeferbrug, about 3,5km in total. Now I’ve added running up the staircase, across the bridge to the island side, up another staircase, across the road, down a staircase, up a staircase onto the bridge, cross the bridge and down the bicycle path. This little added excercise takes me an extra four or five minutes, depending on the weather, my level of energy and my determination level of that day. But this extra few minutes puts such a tremendous strain on my muscles at the end of the run, that I’ve actually had a muscle the first two times I did it. It feels good, and I think I’ll keep it included to my routine as much and as often as I can stomach it. Regarding my weight — it’s funny — late last week I reached 85,1kg (187.6lbs), which is 100 grams (0.2lbs) away from my goal of reaching 85kg (187.4lbs). Because I’m still losing weight under the current workout regime I’ve set up and the small adjustments I’ve made to my diet, I think I will see if I can go down to 83kg (183lbs) and find a good equilibrium in food and nutrition intake and my excercise regime, going back up to 85kg. While BMI is certainly not dogma, it’s a good indicator if you’ve got an average frame, which I do. Ending up at 85kg would leave me with a BMI of 24,57, which is just below the overweight line. The overweight category starts at 25, which I was well over when I started this at 96kg (211.6lbs). Currently, I’m steadily losing about 1kg (2.2lbs) every two weeks. Depending on how easily I’ll reach 83kg, I’ll talk to my doctor, get my blood levels checked to see if I haven’t been doing myself a disservice, and check my body fat percentage and blood pressure. If the doctor has no objections, I’ll start stage two. What is stage two? I’m glad you asked. According to the NHS, BMI’s healthy zone ranges from 18.5 until 24.9, which puts the median BMI at 21.7. The weight you need to reach the median healthy BMI with my height is about 75kg (165.3lbs). I think that’s a very light for me, seeing as how it would mean I would have lost 21kg (46.3lbs) since starting this, but 78kg (172lbs) isn’t unthinkable. In the end, provided my doctor clears me, it’s proving to be so simple to lose body fat that I might just keep doing it until either my body stops losing weight, or I’ve reached 75kg, whichever comes first. I’m already amazed at what I’ve accomplished and am not about to get addicted to the results. Also, I have to keep in mind that the whole dynamic of my body is going to change once I start doing BJJ and MMA again.